Investing time in studying the megatrends of the world, helps think through your own positioning and direction. In a recent Forbes article, out of the 9 technology trends for 2018 outlined, six out of nine had a connecting point with digitalizing industrial assets and the Distence strategy. One, which I left out, the datafication of our lives, also has an interesting angle. In a recent talk at the Nordic IoT Week in Helsinki, Liviu Babitz (Cyborg Nest) had on one of his slides the quote: “I sense, therefore I’m…. MORE”. This quote applies directly in full to the digitalization of assets and the application of edge computing technology in making industrial assets sense more and be more intelligent. The benefit, the “MORE”, is undeniable. Longer life of the asset, higher uptime, more sales, innovative smart services, lower operating cost, just to name a few. All resulting in a higher ROI, not only for the asset, but also for the underlying process and business. Another, perhaps less quantifiable quality of “sensing”, is customer intimacy. Through digitization we get transparency, we are more aware of the assets condition, how it is being used, who is using it and where. Our customers understand how the assets they have delivered to their customers performs the way their customers use the assets. This builds customer intimacy, the ongoing business relationship, regardless of geographical location and increases customer satisfaction and subsequently loyalty and ultimately sales. 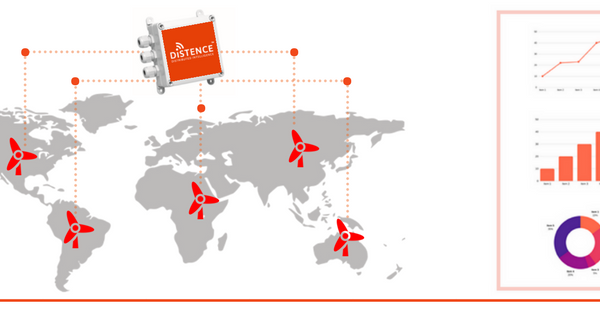 Distence has been a part of the above transformation, the various digitalization trends, for over 10 years. Working closely with our customers a small team has been able to deliver solutions to pretty much all corners of the world together with its customers. A big part of this journey has been R&D, perfecting a solution that is reliable, scalable and meets the needs of the customer in each of the chosen verticals we specialize in, with a special focus on demanding environments. The nature of our customers business is such that engineering, and reliability plays a huge part. Mission critical processes set their bars high and it is our job to exceed them. Reflecting on this journey, fiscal year 2017 and the beginning of 2018 has been a great turning point. Moving from R&D phase to growth stage. The team has more than doubled in size, the board of directors has gotten reinforcement from industry and digitalization experts such as Juha Pankakoski from Konecranes. Krister Hagström, a seasoned executive, joined Distence and opened sales operations in Göteborg, Sweden. Our strong sales promotion efforts, both in Germany and Sweden, are paying off, with the cases and the piloting pipeline increasing multifold from first half of 2017. Panu Virtanen joined Distence as the Operations Manager, also looking over our ISO 9001 certified quality program. Overall, we have been preparing for growth. On the technology front, the launch of our new Condence-platform delivers through new features and architecture, a reliable and flexible tool for device cloud management. Together with our new smart terminals we have entered, in addition to specific components such as industrial gears and other rotating machines, also equipment builders, OEM, in verticals such as cranes in logistics, paper industry, chemical analysis and more. Our eyes are now on international growth. The technology is global, that we can state for sure with installations in over 40 countries. The team has deep and wide expertise in growing a business. The competition is tough naturally, but that is good. It means there is a healthy and big market to be served and Distence is well positioned to be among the winners.